I've tried the everlasting treat and my girl Boo can literally pop the treat out of the toy insert which kind of defeats the point. I thought that it was pretty expensive for how fast she got the treat out. Corgis are so smart that it doesn't take them long to figure those toys out! I did buy the Kong Genius (the cylynder one) during Christmas time and I stuff that with treats, it seems to take her longer to work the treats out of that than the kibble nibble type toys (we have the kong brand of that as well). Good luck! The everlasting treat toys are kind of a waste for the actual "everlasting treat" but I used to cut up jumbone and shove pieces into the everlasting toys, takes FOREVER to get out. The hydrant one seems the most sturdy (I have pretty much all of them). 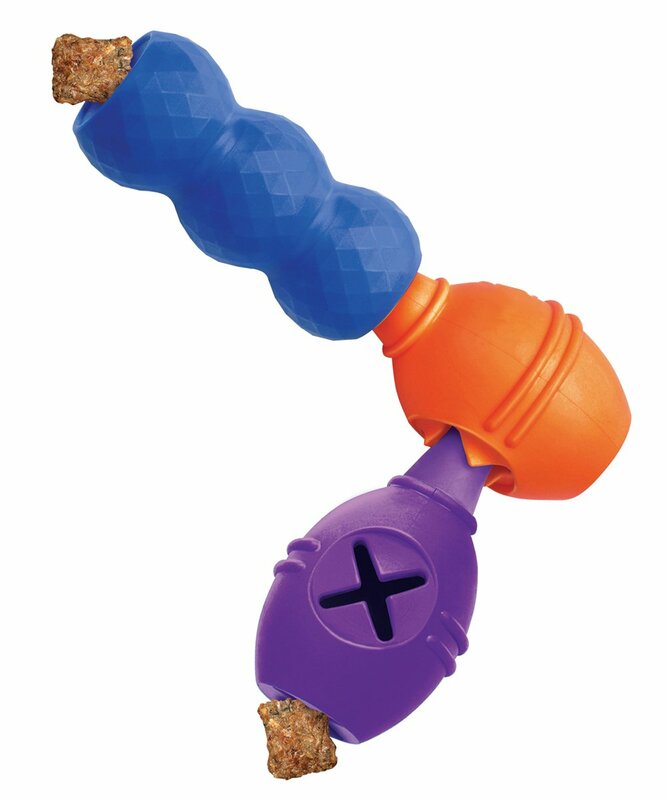 I used the big kong bone and stuffed pieces of dentastix in each end which are also hard to get out. I would only feed about 1/4 of Frank's kibble to him in the morning before I left and the other 3/4 would go in interactive toys for him to eat when I left the house. He gets 3 pieces of Hills T/D kibble with each meal which I stuffed in the everlasting treat toys. This kept him busy while I left and taught him me leaving means yummy treats. Now he could care less when I leave the house. The tug a jug is the only toy Snickers was not able to figure out. We cut out the rope and just use if for a dinner dispenser. I recently got this purple football. It is great! I cram a small dental chew like DentaStix, or the Authority Dental sticks and it takes quite some time to get it out, and Snickers has not been able to damage it at all. I do the same cramming with a medium Occupi, but it is just luck whether they get the treat out easily with that one. I have several for Becca. I try to rotate which she gets. We have both types of the Kong genius the cylinder and the bowling pin. There is a Kong ball that is spiky, it has small spaces to stuff treats. She got a IQ ball for Christmas, but I found it needs supervision. She has two by Busy Buddy, a green dumbell (too easy) and a purple one that looks like a ufo. The purple on screws together. It took a long time for her to initially figure it out. I have a few balls that dispense treats as well, but don't know the brands. I also have two regular Kongs that I stuff and freeze. Freezing them makes them last longer. Thanks everyone for all the responses! I'm going to get a few of these to try out :) I appreciate it (as will Scooter)!